When making quilts, you tend to buy fabric you like. Unfortunately, with any sewing project, all of the material is never used, and scraps are left. Often, quilters try to put these scraps to use in other quilting projects, but sometimes, the pieces are just too narrow to be of much use. 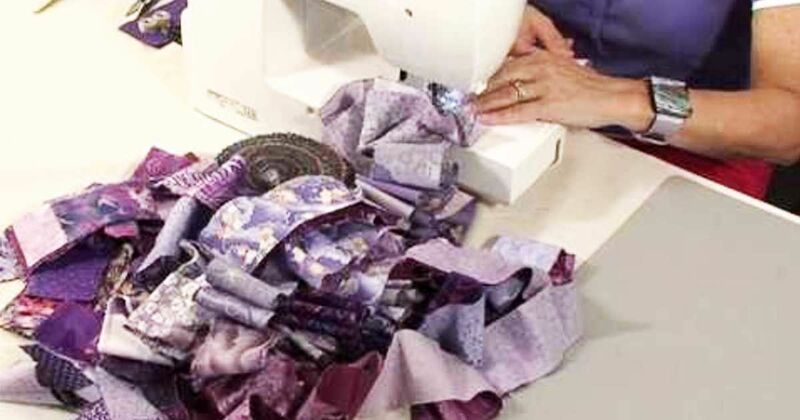 Valerie Nesbitt of Justhands-on.tv puts her scraps to use in a quilt, making the front of it in just 40 minutes. Justhands-on.tv is Britain's YouTube channel for textile art. It has video tutorials for quilting and other needlework. Watch Nesbitt's tutorial below to make her 40-minute scrap quilt top. Nesbitt begins by stitching the ends of her strips together with a diagonal seam. Her reason for the diagonal stitch is simply to give interest to the quilt. Her strips are 2.5 inches wide and 40 inches long. She starts by stitching roughly 30 strips together. Once they have been joined, she folds the strip in half, right side to right side, and sews in a seam. Upon reaching the end, she cuts the strip in half. Her new piece is now two strips wide. Nesbitt folds the strip in half again and stitches the right sides together. Again, she cuts open the strip at the fold. Nesbitt continues to repeat the process until her quilt is thirty-two strips wide. The entire process takes her 40 minutes. The next time you're trying to figure out what to do with your fabric scraps, you might try making a scrap quilt. Nesbitt's results are stunning, and you may find you like your own unique creation. A quick and easy guide to making your first baby clothes quilt! A few easy steps is all it takes!